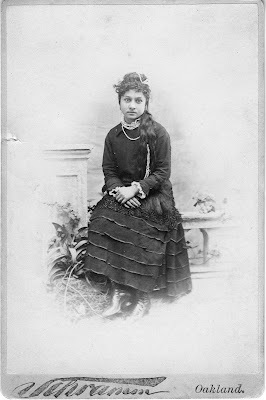 Calla Shasta Miller, 1879. Claremont University Consortium. This Saturday I am going to Joaquin Miller Park for the California Writers Club annual picnic. While visiting Miller's former homestead in the hills above Oakland, I will remember his daughter, Calla Shasta Miller, who is buried somewhere on the grounds in an unmarked grave. The young woman eventually married, but she returned to Ina's Oakland home in 1892, her marriage over. Ina told Charles Warren Stoddard that Calla Shasta came to her "homeless, helpless, and a victim to drink. "(2) Ina secured a doctor to try hypnotism and the Gold Cure, a popular abstinence program that purportedly contained gold, but in reality was a mixture of alcohol, ammonium, strychnine, and boric acid. Calla Shasta did not stay at Ina's house for long. She died in 1903 and Miller buried her in an unmarked grave on his property. Joaquin Miller died ten years later, and although Ina was too sick to attend Miller's funeral at "The Hights," she sent "Vale, Joaquin" to be read. She also asked a friend to look for Calla Shasta's grave and vowed to mark "poor Indian Callie's grave" if she ever could afford to. (3) Ina was not a woman of means, and she never did mark the grave. Ina's own grave at the Mountain View Cemetery remained unmarked from the time of her death in 1928 until 1986 when the Ina Coolbrith Circle gave her a beautiful marble headstone. (1) Calla Shasta Miller to George Miller (Joaquin Miller's brother), November 3, 1879. Joaquin Miller Collection, Honnold/Mudd Library, Claremont College. (2) Coolbrith to Charles Warren Stoddard, August 15, 1892, The Huntington Library, San Marino, CA. (3) Coolbrith to Herbert Bashford, February 25, 1913, The Bancroft Library, University of California, Berkeley.